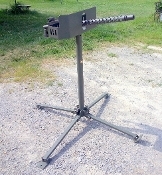 **NEW PRODUCT** Ammo link tray for the M2 tripod with a shield. T&E'S FOR THE 30 CAL TRIPODS. M2 Tripod data plate, Bingham Stamping Co.
M2 tripod data plate. Lovell MFG Co. Copyright © 2003-2019 IRON CREATIONS LLC. All rights reserved.